“All quiet on the Bzura Front” is special exhibition regarding fights in 1915 at Bzura and Rawka river banks bitween Russian and German forces. This battle had lasted over 6 months and, similar to western front in France, it was a trench war type battle – the only one at eastern front in Europe during The Great War. Remarkable is that on Bzura and Rawka Rivers Batle front second time in world’s war history gas attaks occured. 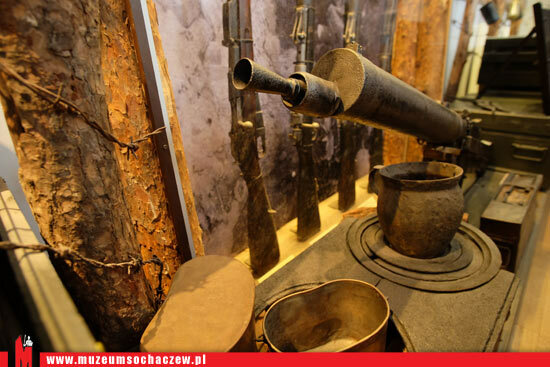 On our exhibition we present great collection of unique photos and relics found on the 1915 year battlefield. You can find here authentic stories and raports of soldiers and war correspondents, front poetry and memories of civil witnesses of that time. In glass-cases we show elements of equipment and weapons of German and Russian armies troops, who fought in here from October 1914 to July 1915.